Specialized cells in the center of the tooth are able to regenerate dentin, the layer of tooth just under the enamel, and the enamel can then properly remineralize from the outside. This same process happens in bones when phytic acid is removed from the diet and minerals/fat soluble vitamins are added. Group Three: Diet low in phytic acid plus vitamin D.
The group consuming phytic acid with no supplemental vitamin D continued to get cavities with little to no healing. The group that just supplemented Vitamin D showed some healing, but also got some new cavities. 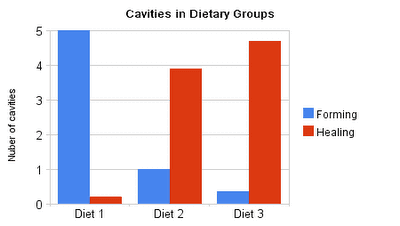 The group consuming no phytic acid and supplementing Vitamin D showed very few new cavities and actually had many existing cavities heal! This entry was posted in Remineralizeing Tooth Enamel. Bookmark the permalink.